Weighty Matters: Dream of Becoming a Professional Gurgitator? Well if you've got a Nintendo Wii, your dream may soon come true with the release of their Major League Eating: The Game title. 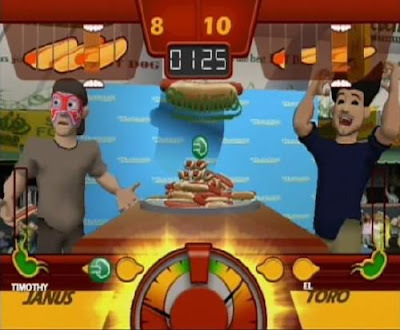 The game aims to bring you the world of competitive eating to the comforts of your own living rooms. Why you ask? Why would anyone want to pretend to be a competitive eater? "Professional gurgitators have the grace of ballerinas yet the brute strength, mental focus, and intestinal fortitude to push their bodies and minds as hard as athletes in any other extreme endurance sport. Victory is sweet and defeat can be well, really, really messy. It's an experience we're proud to help bring into the home." So it's on the Wii, will you have to swallow the controllers? "master a smorgasbord of offensive and defensive weapons including bites, burps, belches, mustard gas and jalapeño flames while cramming and chewing food at a world-class pace"